The weather has significantly changed today! Time to break out all my comfort food recipes and lasagna tops the list. 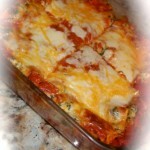 I’m a huge fan of veggie lasagna and by using Mama Jess Garden Good you can really boost the veggie content. This recipe was adapted from a Martha Stewart recipe. I know her recipes can sometime be intimidating – but I promise that you won’t believe how easy this is to make. The no-boil noodles cut out a step and OH…the fontina cheese just makes it! And maybe try my favorite trick for making two small 8×8 lasagnas instead of the 9×13? I bake one and freeze one. Then one hectic night, I can bake the frozen one a be rewarded by the fruits* of my labor! preheat oven to 400 degrees. whisk together ricotta, eggs, 1/2 teaspoon salt and 1/4 teaspoon pepper. squeeze spinach to remove as much liquid as possible, and add to ricotta mixture. stir well. spread thin layer of garden good into bottom of 9x13 glass baking dish. arrange 4 noodles on top. spread one-third of the ricotta mixture over the noodles, followed by one-third of garden good, sprinkle with one-third of the fontina-mozzarella cheese mixture. repeat to make two more layers ending with cheese. at this point you can tightly wrap in plastic and freeze or cover with aluminum foil and bake 30 minutes. remove foil, continue baking until golden brown on top and sauce is bubbling (about 15 minutes more). let cool slightly before cutting into squares to serve.